Yamaha R1 Forum: YZF-R1 Forums > R1 Related Discussion > Appearance & Mods > When you want to carry a bit around on the new R1??? So I picked up my 2015 R1, and a Hepco and Becker Sportsrack, which I have a RJs 39 Litre top box mounted on for the heavy lifting, (Yes I know it is sacrilege) I need to sort out how to get the throwover paniers sorted so they don’t rub the paint in any inconvenient places, and touring duties will be sorted. My problem is when I just want a little bag to throw a couple of things in. 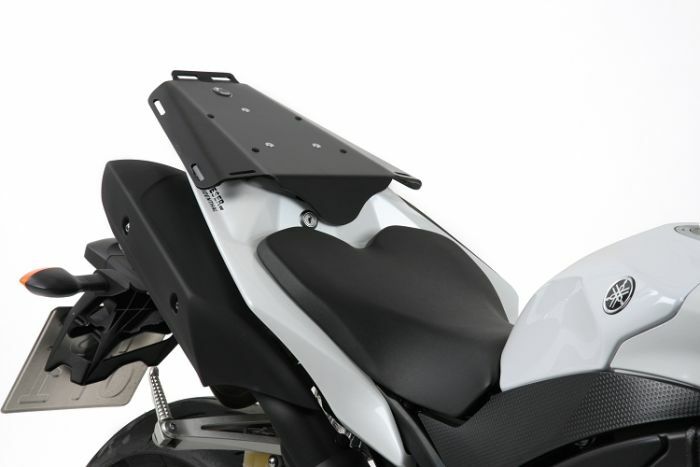 Normally I’d throw a little pillion pack on the back, but that tine little pillion seat that looks like it would penetrate your pillion more than support them is going to leave that sort of thing flapping around like a flag. wow, the 15 R1 is definitely not well suited for travel duties.. its one of the reasons i kept my Gen1..
Last edited by bacchus40; 04-15-2019 at 07:48 PM. Here it is on 2015, it unfortunately bolts on so you can't just remove it with the key, but a topbox bolts onto it nicely. Last edited by Kevap; 04-16-2019 at 03:19 AM.